blogosphere | Phil – Refuelled! I know I’m late to this party, but I just want to grab a few minutes to put down, as I say, a few thoughts. It was great to be there again, even though there were a number of differences from the event last year, which was the first time I attended. The most obvious difference was that the event was fitted into just one day, a Saturday. Views on this varied a lot. I know that it made attendance less workable for some, and more workable for others, the main issue being the impact on the necessary travel and accommodation for attendees. Some, like myself, could manage without staying away from home – a significant cost saving, if you were paying your own expenses. On the other hand, many would have needed to stay away for two nights in order to attend for one long day. Also, I felt this arrangement left less time for chatting to each other! Another difference, though, and a very positive one, which I think was partly due to the one day arrangement, was that many more babies (and ‘on the way’ babies!) were present. I thought this was particularly lovely, considering that a lot of blogging is about parenting and related issues. As before (last year) the content of each part of the event was excellent. I’d like to mention one thing specifically, namely, the address to us all from Anne-Marie Cockburn, who spoke with amazing bravery and openness about the death of her 15-year-old daughter, Martha, as a result of taking the drug Ecstasy (This included reading extracts from her book.) To listen was an extremely moving and eye-opening experience. I’m very happy to say, though, that for by far the most part of the time I felt very much appreciated and accepted, and it was great to meet several bloggers I already knew, and many more whom I’d met ‘on line’ since last year, and could now greet face to face! I have just one more important point to make, in similar vein to how I felt last year. I shall begin by adding a photo. 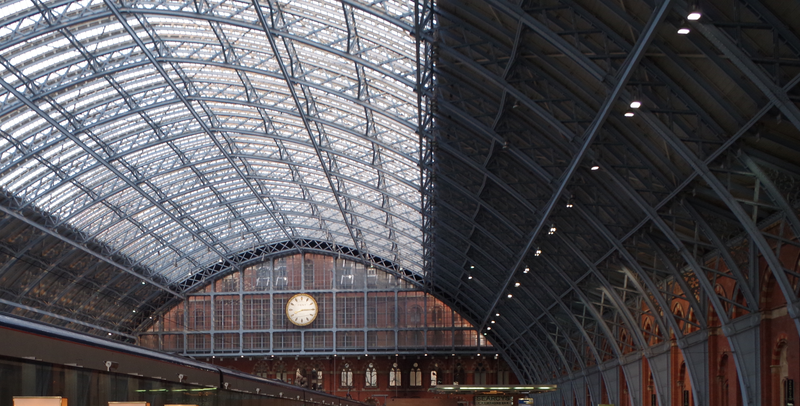 You’re probably wondering what the roof of St. Pancras Station has got to do with BML16 and blogging. Well, materially, very little, apart from the fact that this photo was taken on the same day. But this sight on the way home got me thinking, from a symbolic and figurative point of view. It’s like this: the whole structure is very strong, functional yet beautiful, often taken for granted, and a great many people were involved in its design and construction. Now, how like the blogosphere, as we call the world of blogging, is that? You see, I especially commend this to the many bloggers, some known to me, who feel their place in this scheme of things is not very significant. Maybe you were present at this kind of event for the first time, and, after the award ceremony, were left thinking “Well, that’s me put well and truly in my place!” You know, in one way, you’re right. You were put in your place. And your place, dear blogger, is a special one, just for you. That place is right here. You matter. That’s right. Alongside those winners of all the awards, many great people I feel honoured to know, you belong. Just like each and every piece of steel in that amazing roof, it would make a difference if you were missing. So, if you came, we are glad you did. If you haven’t done so yet, we’d love to see you next time. Thank you for reading. Here’s to #BML17.